On this date in 1940, at a border crossing between Germany and Italy, Benito Mus­so­lini and Adolf Hitler met for the seventh time. (The two would meet seven­teen times.) The Bren­ner Pass meeting of the two Axis Pact dicta­tors followed on the heels of their June 18, 1940, meeting in Munich, which focused on the im­mi­nent French sur­render to the Ger­man Wehr­macht (armed forces) on June 22. In between the two meetings, Mus­so­lini had urged Hitler to allow Italy to par­ti­ci­pate in the planned attack on Great Britain, mostly in order to claim some of the pro­jected spoils, among them semi-inde­pen­dent Egypt, with its Suez Canal, and the jointly adminis­tered Anglo-Egyptian Sudan (modern-day Sudan and South Sudan) to add to Italy’s African empire (at the moment Libya, Ethi­o­pia, Eri­trea, and Ital­ian Somali­land). Hitler politely but firmly re­jected the Duce’s offer of an Ital­ian expe­di­tion­ary corps, citing the dif­fi­cul­ties of sup­plying two inva­sion armies, but accepted modest Ital­ian air force parti­ci­pa­tion against the Royal Air Force during the Battle of Britain (June–September 1940). In the Brenner Pass meeting Mussolini laid the ground­work to justify his next con­quest, Greece, which Hitler didn’t seem to pick up on. Instead, Hitler was pre­occupied with Luft­waffe losses in English skies, which had caused the Fuehrer two and a half weeks ear­lier to post­pone Opera­tion Sea Lion, the amphib­i­ous inva­sion of Great Britain. Also on Hitler’s mind were secret plans to seize Roma­nia’s Ploiești (Ploesti) oil fields in South­eastern Europe in mid-Octo­ber 1940 and secret plans to liq­ui­date the Soviet Union starting in the spring of 1941 (Opera­tion Barba­rossa). 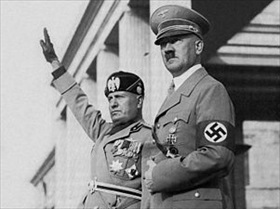 Hitler’s sur­prise move into Roma­nia out­raged Mus­so­lini, who believed that that nation fell geo­graphically within his sphere of interests as was generally under­stood by the two dicta­tors in Octo­ber 1936, just as the Duce’s sur­prise inva­sion of Greece from Italian-occupied Albania in late-October 1940 outraged Hitler. It was almost a truism that whenever the Axis allies acted on their own, things turned out badly for their mili­tary part­ner­ship. The most egre­gious example, of course, was Musso­lini’s mis­adven­ture in Greece, which proved to have nega­tive im­pli­ca­tions for Bar­ba­rossa’s suc­cess. It pushed Hitler’s planned 1941 spring inva­sion of Russia into the sum­mer as German troops rushed to Greece in early April 1941 (Opera­tion Marita) to save the Ital­ian Army from an igno­min­ious defeat by a com­bined Greek-British expe­di­tionary force. Hitler admit­ted: “If the Ital­ians hadn’t attacked Greece and needed our help, the war would have taken a dif­fer­ent course. We could have anti­ci­pated the Rus­sian cold by weeks and con­quered Lenin­grad and Moscow. There would have been no Stalingrad.” Following the Stalin­grad debacle, shattered and demor­alized men of the Ital­ian, Roma­nian, Hun­garian, Slovak, and Croatian armed forces, Hitler’s allies, retreated behind their national borders, awaiting payback. Left: Mussolini and Hitler review Nazi Party troops parading before one of two “Honor Temples” (Ehren­tempel) on Koenigs­platz, Munich, Septem­ber 25, 1937. Musso­lini’s visit to Munich, Berlin, and Essen, the latter city being the Euro­pean capital of the steel and arma­ments indus­tries, cost Germany mil­lions of Reichmarks. Both dic­ta­tors used the occa­sion to cement bi­lateral ties of friend­ship, which had first been laid down in a friend­ship pact signed by their for­eign minis­ters in late Octo­ber 1936. The Germans were rewarded with assur­ances from the Ital­ians that “special German inter­ests in Austria would not be opposed by Italy,” a green light for the March 1938 Nazi takeover of that country (Anschluss). 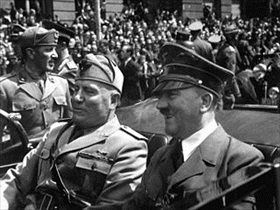 Right: Mussolini visited a clearly triumphant Hitler on June 18, 1940, driving through Munich’s streets in a convert­ible car and holding discus­sions with his Axis part­ner on how to divvy up French spoils as all signs pointed to a Franco-German armis­tice in the wake of Germany’s invasion of France on May 10. The discus­sions were held in the Fuehrer­bau in the same room where he, Hitler, French Premier Édouard Dala­dier, and British Prime Minis­ter Neville Cham­ber­lain had divvied up Czechoslovakia in September 1938.